Now that I am living in Germany again I have the need to find out everything about my country the best I can, to tell you which places to see visit and experience. 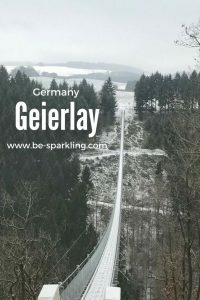 I remember when my friend told me to accompany him to see this suspension bridge called Geierlay, I looked at him like: ‘Seriously? It’s a bridge no?’ – but now that I’ve seen it, it definitely is something to see. From Frankfurt it took us around 1,5 hours drive to get to the small town Mörsdorf. Parking in winter was easy, but I don’t know how this is during summer time. The walk from there is around 15minutes. The air is fresh and it is a moment to relax for everyone of you who likes to enjoy the nature. 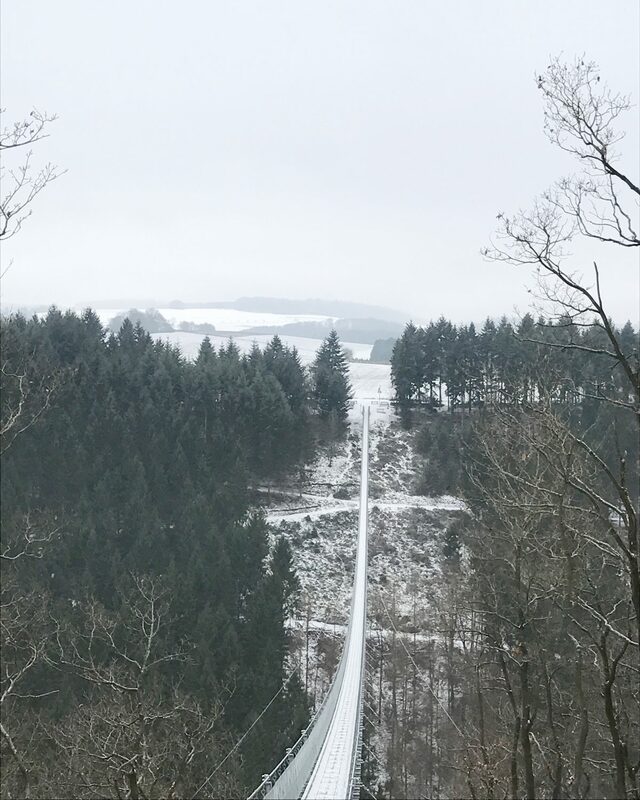 But see for yourself, the view is breathtaking, the nature is beautiful and the hight is impressive, especially when thinking about the structure you’re standing on – and yes, it moves! How to get there? By car and only by car! What else? Parking costs 2€ for 2 hours and you’ll have to walk around 15min to get to the bridge. Have you been there? Have you made any other experiences? Let me know in the comments! Yikes, that would be hard to walk with snow – used to live 1 hr. or so from the German border (in Holland). Heard it’s cold right now – stay warm! What an interesting experience! 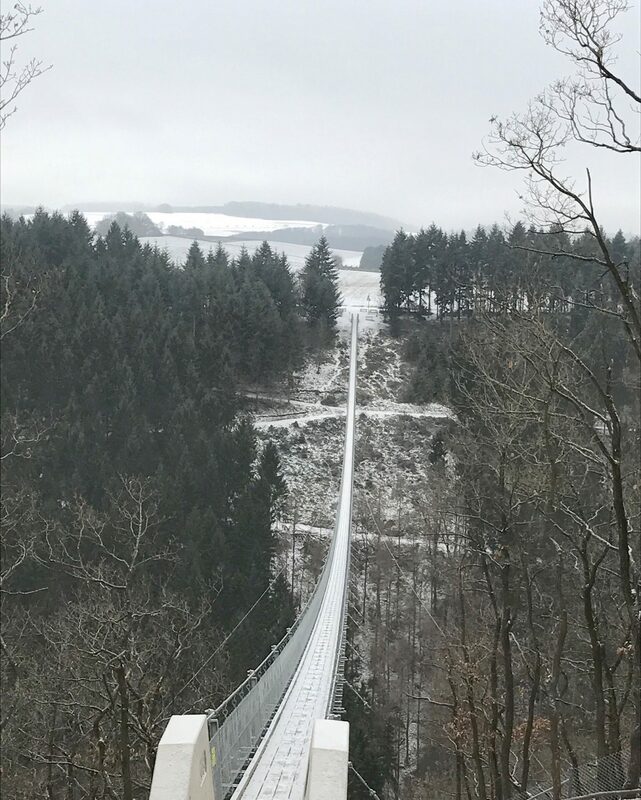 I lived in Germany for 5 months in 2013 and yet never heard of this bridge before. What a shame! BTW How long is it? Oh! That’s really really really long!!! I’ve been to a suspension bridge in Kerala in India. Its always so much fun and thrill to stand on them when the wind is literally swaying the bridge! I’ve actually never walked across a suspension bridge! This one looks so massive, quite the experience! Oh! Its so long. I might visit Germany this year and for sure then this will be on my list. Reading this i am feeling cold breeze and sway you can enjoy there. This is a beautiful sight. If a bride is adventurous enough she couls make the bridge as photo backdrop. 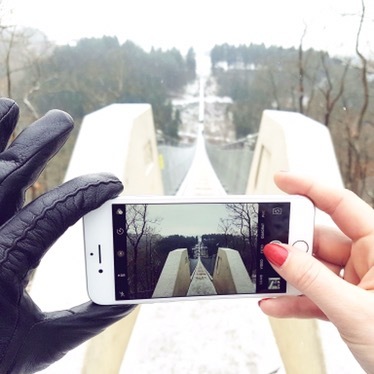 You might also like famous glass bridge in China! Wow! This is an awesome tip! I’m actually in Germany and I have a new goal to visit before leaving!! 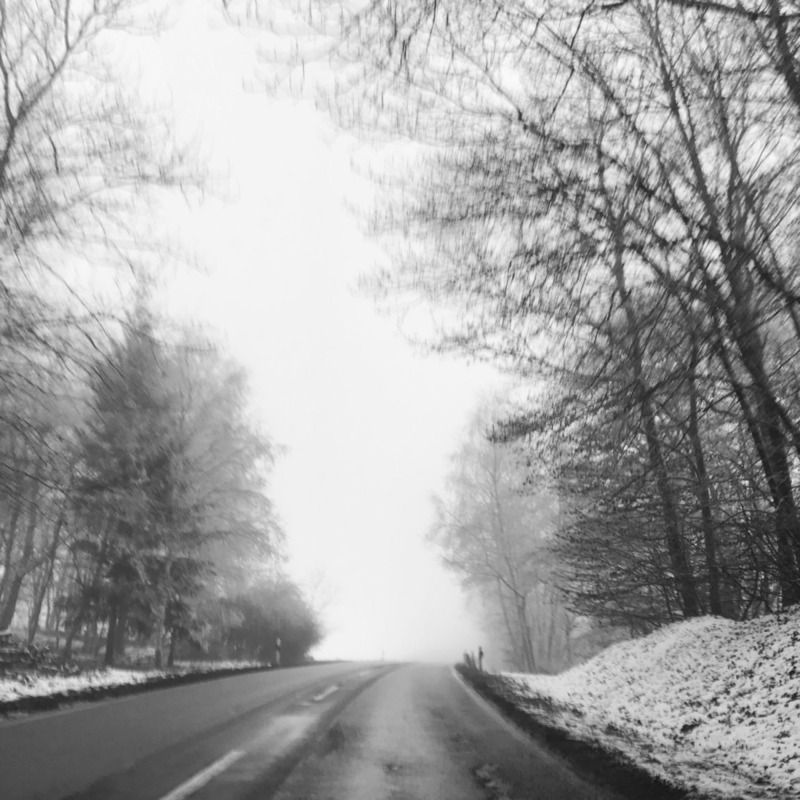 It really looks so beautiful with the winter mood! Thank you for sharing! Wow, that DOES look long. Haven’t been to Germany but adding this location to my list. Looks even more beautiful with the snow! I love exploring Man made wonders! 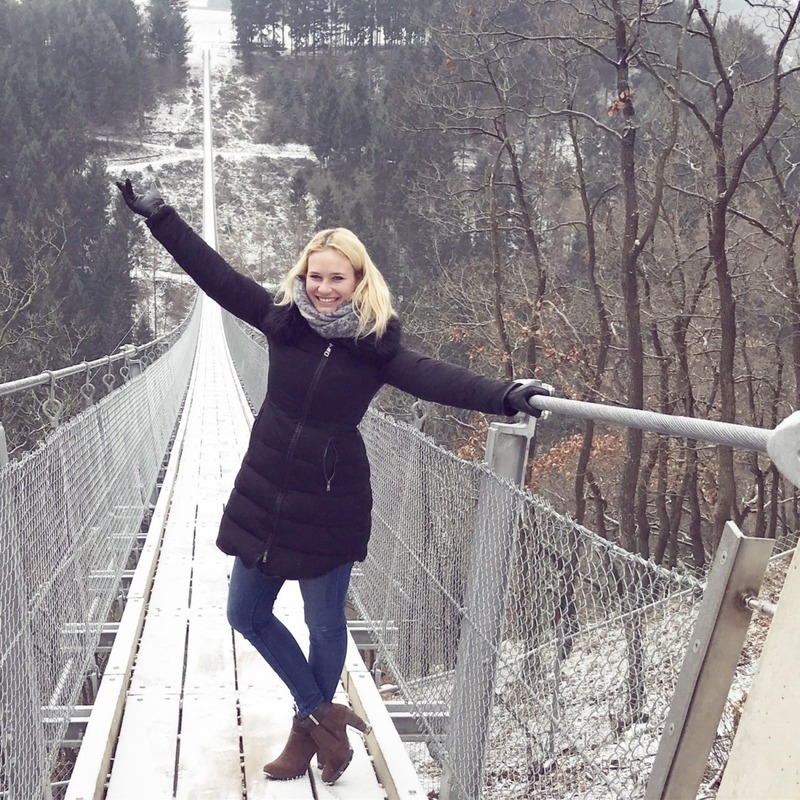 Glad to know about the Germany’s longest Suspension Bridge! 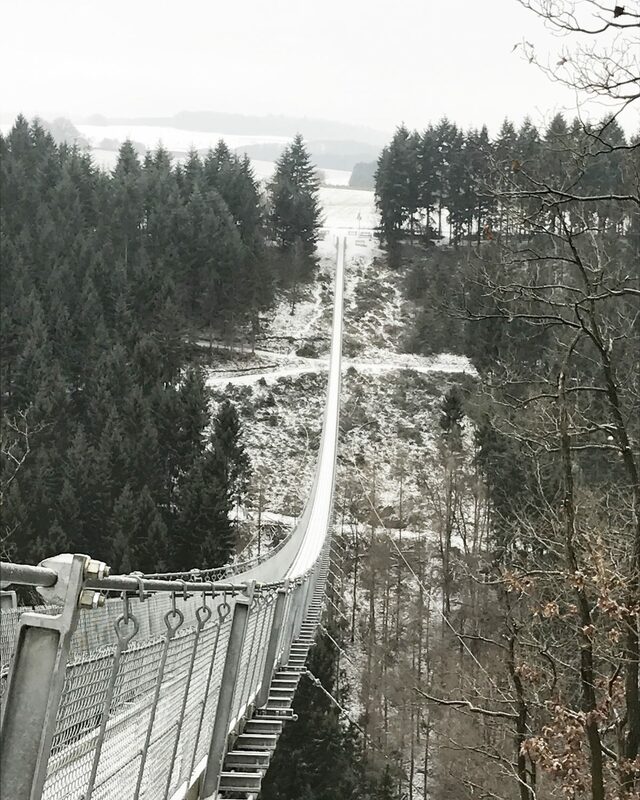 I’ve never even heard of Germany’s longest suspension bridge. But I do love traveling in Germany and your photos are great. Looks like fun! It’s an impressive bridge indeed! Looking at the bridge, the only thing I can say is that I would probably be terrified to cross it. I had troubles going over a 55 meters suspension bridge in Spain. How long is this one? Was there a lot of people when you went? I would want it all to myself to take pictures! I have definitely never been but would love to go next time I am back in Germany! It seems a bit scary, but now I have another place to visit in Germany. Thanks for linking up with #wkendtravelinspiration! I had the exact same reaction when people told me to go see the Suspension Bridge just outside Vancouver, Canada. But then I saw some photos and went there myself and it all made sense. Glad your bridge lived up to the expectations! Seems like quite an adventure to walk along this bridge…am sure that the views would be worth it.